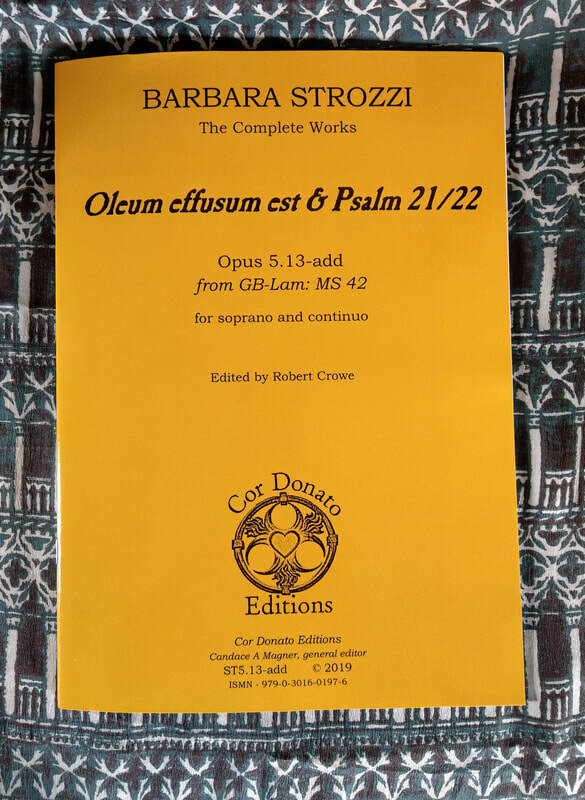 I'm delighted to be able to announce that my critical edition of Barbara Strozzi's "Oleum Effusum Est" + "Psalm 22" has now been officially released as a part of Cor Donato Editions' Complete Works of Barbara Strozzi. This motet is significantly longer than the "Oleum" contained in Strozzi's Opus 5, "Sacri musicali affetti," and has been falsely attributed to Giacomo Carissimi for well over two hundred years. Many thanks to senior editor Candace Magner for her invaluable help in getting this 402-measure masterpiece ready for publication! This longer work is very appropriate for Lent (the shorter, original "Oleum" is actually for January 1 or 2)--so there's still plenty of time if you're looking to program a wonderfully introspective piece for medium high voice. (Original Soprano + basso continuo, b to a''/B3 to A5). Please drop by the Cor Donato website. The European paper copy will be ready very soon and the paper copy for the US and Canada is already available. Digital versions for both will very soon be available. Lutenist Sigrun Richter and I are happy to announce that we will be holding a joint master course in Lute song (including also solo lute music) this summer, August 5-11, 2018, in Schwäbisch Gmünd's historic Schwörhaus. This course is open to students, professionals and serious amateurs: the most-improved course participant will be awarded the Hans Judenkünig Prize by the city of Schwäbisch Gmünd at the course participants' public concert at the end of the week. Please follow this link for the program.